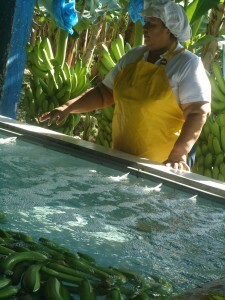 Aimeth Angulo, a Colombian producer of Fairtrade bananas, will be touring Yorkshire during Fairtrade Fortnight (24th February to 9th March) to tell of the difference Fairtrade has made to her life and to her community. Aimeth will be visiting schools, universities and community groups during the tour. She will also be attending the following events which are open to all members of the public. Do come along and meet her. The full line-up of Aimeth’s events is below – don’t forgot to check the events page for other events taking place across Yorkshire during Fairtrade Fortnight.